The Upper Cascade by Joel Deutsch - 8.000" x 6.000"
The Upper Cascade framed print by Joel Deutsch. Bring your print to life with hundreds of different frame and mat combinations. Our framed prints are assembled, packaged, and shipped by our expert framing staff and delivered "ready to hang" with pre-attached hanging wire, mounting hooks, and nails. 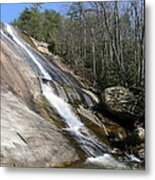 There are no comments for The Upper Cascade. Click here to post the first comment. 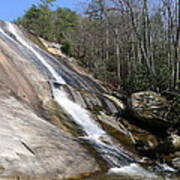 This is the upper cascade of Stone Mountain Falls. It has the longest uninterrupted veil of any waterfall in North Carolina, about 200 feet. We never get tired of hiking to this beautiful spot, but that does not rule out getting tired hiking to this beautiful spot. Never go out without your sketchbook. Paint fearlessly! Cultivate obscurity, you�ll grow freedom. We are the eyes and ears of God! All images are copyright � 2008-2015 All Rights Reserved.